Welcome to the latest issue of POLICY WATCH, now to be released on a fortnightly rather than weekly basis. Since the last release of POLICY WATCH the PM has announced the election date on November 8th. With the date finally announced it is hoped that the parties will start to tell us a bit more about their policies. At Council we are particularly interested in the policies which will help to improve the quality of life of people with the least wealth, power and ultimately voice. We will be tracking party policies on affordable housing (rental and ownership), policies to address poverty (including child poverty) and policies which will help to grow strong communities and social services. Examples of specific policies of interest include the reintroduction of universal child support payment, tax reform, and whether benefit levels will be lifted. On Monday 8 September NZCCSS sent an Open Letter to Political Candidates in which we asked all politicans (elected and list) to "front up to the issue of reducing persistent levels of poverty in Aotearoa NZ". Each politician was asked to demonstrate what actions they will take to improve the quality of life of the most vulnerable members in society. This Open Letter was supported by Church leaders of the Anglican, Baptist, Catholic, Methodist, Presbyterian and Salvation Army churches. To date we have had responses from the party leaders of the NZ Alliance Party and the Progressive Party. The Alliance Party has released its Alliance Manifesto 2008 in which they outline their policies to "put people first". 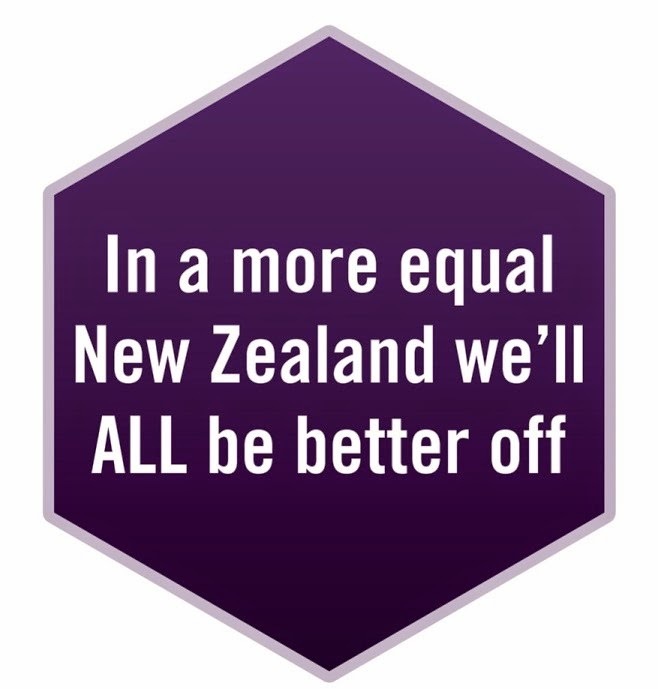 Jim Anderton from the Progressive Party responded that poverty in NZ is "totally unjustified" and that "the principal basis for achieving an end to poverty lies in moving as close as we can to full employment at decent wages". Alliance co-leader Kay Murray stated their position that it is entirely possible to all but eliminate child poverty in New Zealand. There has also been coverage of the Open Letter from Christian Today in the UK, and across other media. This week is the annual Social Justice Week marked by the Catholic Church, which through its social justice arm Caritas is focusing on the issue of poverty in our affluent society. We fully support Caritas in its key message that the election debates and discussions over the next eight weeks must focus on how we care for the most poor and vulnerable amongst us. Last week I attended the Every Child Counts conference held in Wellington. Both John Key and Ruth Dyson gave addresses and the smaller parties were invited to give a short presentation on their party's policies. The crowd quizzed Key on his prior press release regarding disbanding the Families Commission and giving the money to NGOs - an idea not generally well recieved at the conference. In his speech Key talked about a five point plan to lift economic performance. Growing the economy was National's approach to increasing the governments levels of expenditure on health and edcuation. Like Labour, work was seen as the pathway out of poverty, and reference was made to 'personal responsibility' and 'learning to work hard'. Dyson's speech reiterated Labour's progress in assisting families over the last nine years. Reference was made to continuing to raise the minimum wage, reviewing benefit abatement levels and maintaining the worth of Family Tax Credits. Dyson had earlier met with Lady Doreen Massey, Chair of the All Party Parliamentary Group on Children in the UK (& speaker at the Every Child Counts Conference) and was urged to consider setting up a cross party caucas for children's issues in NZ. Whilst expressing some initial reluctance at this idea (and the idea of establishing a Minister for Children) Dyson did agree to propose these ideas to her colleagues, having been encouraged by the UK example. One of the most interesting conference presentations I attended was on the importance of secure attachment in the early years (0-3) in terms of brain development. The workshop was delivered by Nathan Mikaere-Wallis and Trish Hunt both of whom are involved in the Brainwave Trust . Did you know that the first three years of life are spent gathering data and that the brain of your average 3 year old is twice as active as an adult? Also the brain starts pruning back pathways after the age of three if they are not being used? On the bright side, the key to learning in the early years include activities that create pleasure such as laughter singing and movement. So most of us as parents did the right thing instinctively. Children’s Commissioner Dr Cindy Kiro said today she supports Every Child Counts’ call for children’s interests to be at the centre of government decision-making. Dr Hone Kaa response to Key's speech with a timely reminder about the history of benign hatred of the poor. Last week the Green Party released its children's policy on the day before the conference. Many align with the priorities of NZCCSS. As more policies comes to date we will share these with you. For those who attended the Presbyterian Support Northern Keeping Kids Safe Conference in April, the conference proceedings are now available. If you work with people experiencing difficulties in accessing their full and correct entitlements from Work and Income you might find it useful to view MSD's operational policy material for external recipients. For those of you feeling cynical about the election and wondering about the credibility of the pre-election promises you may be encouraged by the finding of a PHD student from Canterbury who reviewed 33 years of New Zealand government spanning 11 terms from 1972-2005. Nathan McClusky found "the major New Zealand political parties that were in Government between 1972 and 2005 honoured at least half of their pre-election manifesto pledges, with some administrations nearly 90 percent true to their word". And to change the subject completely, if you work with older people are you aware of the Ministry of Health subsidy through the SuperGold card for hearing aids? It's valued at up to $1000 for two hearing aids from 1 October 2008.